The fastest, simple and more comfortable way of getting from El Prat airport to the Barcelona city center is Aerobus, a direct shuttle bus service connecting both terminals (Terminal 1 and Terminal 2) with strategic traansport hubs in Barcelona. To begin with, its excellent service and fast timing have turned Aerobus into the most popular service for travellers who wish to get quickly to their destination. There is a bus departing to Barcelona every 5 minutes. Aerobus has a separate bus service for each of the 2 terminals in El Prat airport (Line A1 and Line A2), stopping along the route in Plaza España, Gran Vía-Urgell, Pl. Universitat and Pl. Catalunya. Buying your tickets online for Aerobus will make your trip faster and will help you avoid lines. On top of that, you can also pay with Paypal! Just click on the link above and choose the ticket of your choice and quantity. After paying, you’ll receive an electronic ticket on your email or you can also choose to print it right away or save it on your smartphone on PDF format. Just show the ticket upon your arrival in order to exchange it. During the 30-35 minute trip, you can enjoy free WIFI, USB chargers on board, TV monitor with key information about Barcelona and plenty of space for your luggage. On top of that, all the buses are adapted for persons with reduced mobility and you get a free tourist map with practical info, discounts and all the free available WIFI spots in Barcelona. Buy your tickets in advance by clicking on the banner. You will get them automatically on your email. Then, proceed to print them, or carry it in your phone and show them to the driver upon your arrival. Children under 4 years old travel for free. This timetable is effective every day of the week, 365 days a year, including holidays. If your trip is 15 days or shorter, buy the return ticket and save 1.60€. 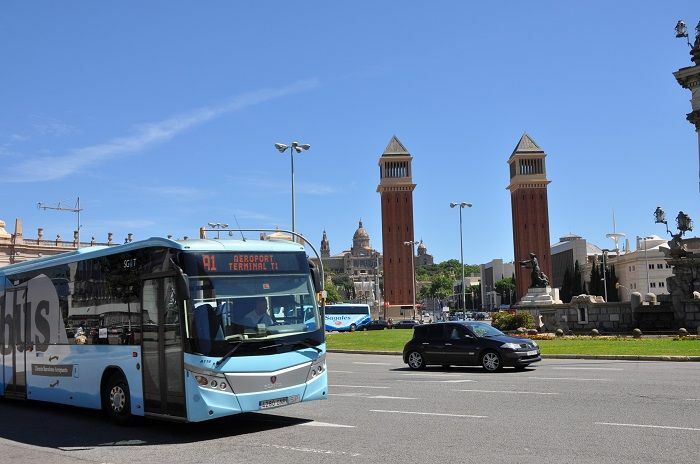 Check your destination before taking the Aerobus at the airport, some stops other than Plaza Catalunya may suit you better for connecting with Metro or Bus. There are separate buses for Terminal 1 and 2, each identified as A1 and A2. If you catch one by mistake, there is a free shuttle bus service in El Prat Airport that constantly connects both terminals. There are other ways to get from the airport to Barcelona. Click here to find all about them.